Tony Pulis today pondered the challenge posed by a "tough" Fulham team, who will test Boro's rest promotion credentials at the Riverside tomorrow. Can Boro keep the Pulis revival going? Kick off 3pm. Boro face an attack minded Fulham side that will pose plenty of questions tomorrow. We escaped with a late Cyrus Christe goal down at Craven Cottage after the Londoners had tortured us with their speedy attack. It will be interesting to see what plan Tony Pulis puts in place to counter their threats and also whether we can continue having sucess ourselves. Can Traore and Downing continue to feed chances for our forward-line? Tony Pulis mentioned that there were injury concerns for going into this game. While he didn't name names he mentioned some players were sitting out training and some could be sitting out of the first team tomorrow as a result of not being fully fit. So there could be changes in the offing. 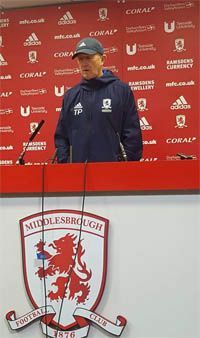 It was stand and deliver once more as Tony Pulis addressed the media dressed in his TP top and baseball cap. The 9am Friday roll call saw him revealing that he is trying to catch up fast with his Championship knowledge, taking in the Sheffield derby tonight for instance. But he wondered whether bringing fresh eyes to the division could in some ways be an advantage. He once again hinted there will be outs and hopefully ins in the transfer window. There have been no offers received or made as yet. Everything is at the tentative enquiry stage as yet. There could be an over balance in some areas from the kind of shape he prefers. But he says he hasn't been in place long enough to have a firm grip on the football club yet. He will be relying on the thoughts of others to help. But we are also busy arranging behind closed games to allow more opportunity to run the rule over a few players that haven't had first team game time during his short time at Boro. But back to the game tomorrow. Tony Pulis is the first to say that he isn't a messiah and can't change everything around in a couple of weeks. But we have shown in the last two matches and also in the two matches before he took the reigns that we are no longer afraid of our opponents. We no longer fear conceding an early goal. We also no longer doubt our ability to his back from a deficit. Nor that we have the tools or the tactical know how to change tack and direction mid-match. I cannot wait for the challenge tomorrow. Can we take down Fulham and continue to move on up? Yes, we can.